BEHOLD the character of those with whom God is pleased. They are a spiritual people, and God, who is a Spirit, must love and delight in that which harmonizes with His own nature. Faith may be feeble, grace may be limited, and knowledge may be defective; yet, if there be just that strength of faith that travels to, and leans upon, the sacrifice of Jesus, and just that measure of love that constrains to a sincere, though imperfect, obedience, with just that extent of knowledge that discerns Christ to be the Savior of a poor lost sinner, then, there is one who is pleasing to God. They are also an accepted people, and therefore their people are pleasing to Him. The delight of the Father in the person of His Son reveals to us the great secret of His marvelous delight in us. “This is my beloved Son, in whom I am well pleased.” Blessed truth to those who see enough defilement and imperfection in their best doings, to cover them with eternal confusion and shame!—who, after the most spiritual performances, are constrained to repair in penitence and confession to Him, who bears the iniquity of His people’s holy things. Sweet truth to fall back upon in all the failures and flaws we are perpetually discerning in our works, in our motives, and our ends—blots not appearing upon the surface, but visible to the microscopic eye of faith, which sees material for self-condemnation, where others, in their fond and blind affection, approve and applaud. If God, my Father, is well pleased in His Son, then is it a truth, strictly inferential, that He is well pleased in me whom He beholds in His Son. But not their people only, their offerings also are equally pleasing to God. “I will accept you” (the person first), “with your sweet savor” (the offering next). Their preceptive walk likewise pleases Him. Is the obedience of the child, springing from love, a pleasing and acceptable offering to a parent’s heart? Ah! how imperfectly are we aware of the beauty and fragrance there are to God in a single act of filial, holy obedience, the fruit and offering of a divine and deathless affection! How great and exalted the heavenly calling of the Christian! Aim to walk worthy of it. Debase it not by allying it with a carnal mind. Impair not your spiritual life by enchaining it to spiritual death. Let the friendships which you cultivate, and the relationships of life which you form, be heavenly in their nature, and eternal in their duration. Seek to please God in all things. Rest not where you are, even though you may have attained beyond your fellows. Let your standard of heavenly-mindedness do not be that of the saints, but of Christ. Study not a copy, but the original. High aims will secure high attainments. He is the most heavenly, and the happiest, who the most closely resembles his Divine Master. THE duty of brotherly admonition and reproof is a perfectly legitimate exercise of Christian love. It may be found the most difficult, but the result will prove it to be the most holy and precious operation of this grace. The Church of God is one family, linked together by ties and interests the closest, the holiest, and the tenderest. It is natural, therefore, that each member should desire for the others the utmost perfection of Christian attainment, and must feel honored or dishonored, as the case may be, by the walk and conversation of those with whom the relationship is so close. In Christian friendship, too, the same feeling is recognized. We naturally feel anxious to see in one whom we tenderly love the removal of whatever detracts from the beauty, the symmetry, and the perfection of Christian character. Here, then, will the duty of brotherly admonition and reproof find its appropriate sphere of exercise. Few things contribute more to the formation of Christian character, and to the holy walk of a church, than the faithful, Christ-like discharge of this duty. It is true it requires no ordinary degree of grace in him who administers, and in him who receives, the reproof. That in the one there should be nothing of the spirit which seems to say, “Stand by, I am holier than you,” nothing to give needless pain or humiliation, but the utmost meekness, gentleness, and tenderness; and that in the other, there should be the tractable and humble mind, that admits the failing, receives the reproof, and is grateful for the admonition. “Let the righteous smite me,” says David, “it shall be a kindness; and let him reprove me, it shall be an excellent oil.” Thus, while this duty is administered and received in the spirit of the meek and lowly Jesus, the church will be kindly affectioned one to another, knit together in love, and growing up into that state in which she will be without spot, or wrinkle, or any such thing. True Christian love will avoid taking the seat of judgment. There are few violations of the law of love more common than those rash and premature judgments, which some Christians are ever ready to pronounce upon the actions, the principles, and the motives of others. And yet a more difficult and delicate position no Christian can be placed in than this. To form a true and correct opinion of a certain line of conduct, we must often possess the heart-searching eye of God. We must be intimately acquainted with all the hidden motives, and must be fully in possession of all the concomitant circumstances of the case, before we can possibly arrive at anything like an accurate opinion. It is an individual, an anticipative, and a present intercession. It embraces all the personal needs of each believer, it precedes each temptation and each trial, and at the moment that the sympathy and the prayers of the Savior are the most called for, and are felt to be the most soothing, it bears the saint and his sorrow on its bosom before the throne. Just at a crisis of his history, at a juncture, perhaps, the most critical in his history, the heart, oppressed with its emotions, cannot breathe a prayer—Jesus is remembering him, sympathizing with him, and interceding for him. Oh, who can fully describe the blessings that flow through the intercession of the Son of God? The love, the sympathy, the forethought, the carefulness, the minute interest in all our concerns, are blessings beyond description. Tried, tempted believer! Jesus makes intercession for you, Your case is not unknown to Him. Your sorrow is not hidden from Him. Your name is on His heart; your burden is on His shoulder; and because He not only has prayed for you, but prays for you now, your faith shall not fail. Your great accuser may stand at your right hand to condemn you, but your great Advocate is at the right hand of God to plead for you. And greater is He that is for you, than all that are against you. The mediatorial work of Christ shuts every mouth, meets every accusation, and ignores every indictment that can be brought against those for whom He died, rose again, ascended up on high, and makes intercession. ONE exercise of Christian love will be its endeavor to avoid all occasions of offence. These, through the many and fast-clinging infirmities of the saints of God, will often occur. But they are to be avoided, and, in the exercise of that love which proves our Christian character, they will be avoided. The child of God will desire to “keep the unity of the Spirit in the bond of peace.” Whatever tends to weaken that bond he will endeavor to lay aside. Whatever He may discover in his communion with the saints calculated to wound, to distress, to alienate, to offend, either in his manner or in his spirit, the healthy exercise of holy love will constrain him to overcome. He will avoid “giving offence.” He will be modest in the expression of his own opinion, respectful and deferential towards the opinion of others. He will avoid that recklessness of spirit which, under the cover of faithfulness, cares not to estimate consequences; but which, pursuing its heedless way, often crushes beneath its rough-shod heel the finest feelings of the human heart; saying and doing what it pleases, regardless of the wounds which, all the while, it is deeply and, irreparably inflicting. How sedulous, too, will he be to avoid anything like a dictatorial manner in enunciating his judgment, and all hard words and strong expressions in differing from authorities of equal, perhaps of greater, weight than his own. Oh! were this divine affection but more deeply lodged in the hearts of all those who “profess and call themselves Christians,” what courtesy of manner—what grace of deportment—what tender regard of each other’s feelings—what kindness in word and in action—what carefulness to avoid inflicting even a momentary pain—what putting away, as becomes saints, all wrath, anger, evil speaking, and malice—and what constant remembrance of His solemn words who said, “Whoever shall offend one of these little ones which believe in me, it were better that a mill-stone were hanged about his neck, and that he were drowned in the depths of the sea,” would each believer exhibit! Lord, fill our souls more and more with this lovely grace of love! Especially in Church communion will the grace of forbearance be called in requisition. When the providence of God has thrown together a community of individuals, composed of a great variety of character, of mind, and of constitutional temperament, although each grade may be more or less modified by the renewing of the Spirit, there will still be a broad field for the passive exercise of love. In a Church, necessarily imperfect, there may exist many things, in which taste as well as judgment will be found at fault, calculated to engender a feeling of dislike, and even of disgust, in a mind refined and delicate. But here Christian forbearance must be exercised. They are the infirmities of the weak of Christ’s flock, and they who are stronger in grace should kindly and patiently bear them. In pursuing a different course, we may wound some of the most gracious, humble, and prayerful saints of God. them less that was rough in speech, abrupt and forward in manner, and fault-finding in disposition, they may detect in us a loftiness of spirit, a coldness of demeanor, and an apparent haughtiness of carriage, which may be an equal trial to them, demanding the exercise on their part of the same grace of forbearance towards us. How watchful, how tender, how kind, then, should we be, ever standing with the broad mantle of charity in our hands, prepared to cast it over the failings of a Christian brother, the moment it meets the eye! 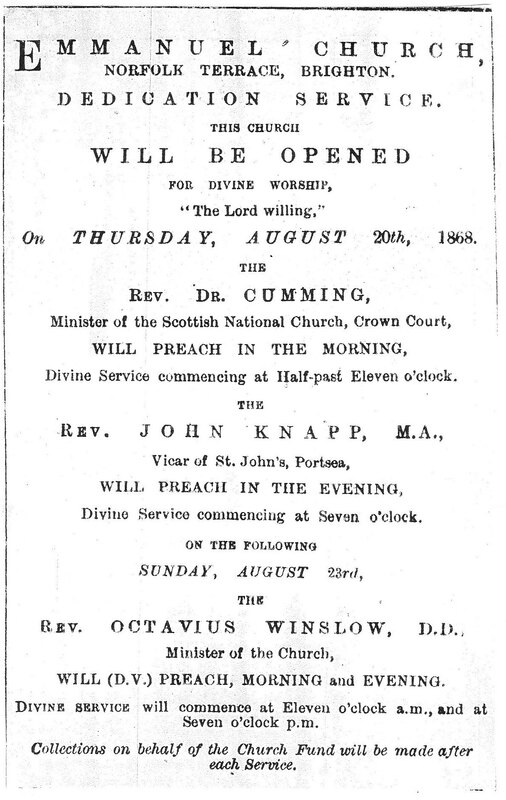 Below is a newspaper clipping from the Brighton Gazette advertising the opening of Winslow’s last church he held a pastorate at in Brighton, UK. Coincidentally, it was on August 20… my birthday. Winslow kicked up quite a bit of dust during this occasion due to the fact that he invited the Rev. 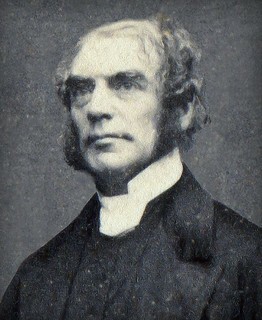 John Knapp, an Anglican, to preach during the dedication service. In those days, any ministers of the Church of England were absolutely forbidden to preach in dissenting (churches not of the Church of England) churches. I will post more on this controversy later. The exercise of private judgment is the natural and inalienable right of every individual. Sanctified by the Spirit of God, it becomes a precious privilege of the believer. He prizes it more than riches, claims it as one of the immunities of his heavenly citizenship, and will surrender it only with life itself. Christian love will avoid infringing, in the least degree, upon this sacred right. I am bound by the law of love to concede to my brother, to its fullest extent, that which I claim for myself. I am moreover bound to believe him conscientious and honest in the views which holds, and that he maintains them in a reverence for the word, and in the exercise of the fear of God. He does not see eye to eye with me in every point of truth—our views of church government, of ordinances, and of some of the doctrines are not alike. And yet, discerning a perfect agreement as to the one great and only way of salvation—and still more, marking in him much of the lowly, loving spirit of his Master, with an earnest desire, in simplicity and godly sincerity, to serve Him—how can I cherish or manifest towards him any other than a feeling of brotherly love? God loves him, God bears with him; and Christ may see in him, despite of a creed less accurately balanced with the word of truth than mine, a walk more in harmony with the holy, self-denying, God-glorifying precepts of that truth. With an orthodoxy less perfect, there may be a life more holy. With less illumination in the judgment, there may be more grace in the heart. How charitable in my interpretation, then, how loving in my spirit, how kind and gentle in my manner, should I be towards him. How jealous, too, ought I to be, of that independence of mind, in the exercise of which he may, notwithstanding, have arrived at conclusions opposite to my own. God has been graciously pleased to appoint His church the great conservator of His truth, and His truth the especial medium of sanctification to His church; there is a close and beautiful relation between the two. The church may be compared to the golden lamp which contains the sacred oil, which, in its turn, feeds the flame of its light and holiness. The church is to guard with a jealous and vigilant eye the purity of the truth, while the truth is to beautify and sanctify the ark which preserves it. Thus there is a close relation, and a reciprocal influence, between the church of Christ and the truth of God. Here is unfolded one of the most solemn and affecting truths touching the character and individual responsibility of a child of God. He is a subject of truth, he is a repository of the truth, and he is a witness for the truth; yes, he is the only living witness to the truth which God has on earth. The world he lives in is a dark, polluted, God-blaspheming, Christ-denying, truth-despising world. The saints who have been called out of it according to His eternal purpose and love, and by His sovereign, distinguishing, and free grace, are the only lights and the only salt in the midst of this moral darkness and corruption. Here and there a light glimmers, irradiating the gloomy sphere in which it moves; here and there a spot of verdure appears, relieving the arid and barren desolation by which it is surrounded. These are the saints of the Most High, the witnesses of the Divine character, the omnipotent power, and the holy tendency, of God’s blessed truth. Let the saints of God, then, solemnly weigh this affecting fact, that though the written word and the accompanying Spirit are God’s witnesses in the world, yet they are the only living exemplification of the power of the truth, and, as such, are earnestly exhorted to be “blameless and harmless, the sons of God without rebuke, in the midst of a crooked and perverse nation, among whom you shine as lights in the world.” Let them be careful to maintain good works, and so walk in all the holiness of the truth they profess; let them see that by no carelessness of deportment, by no want of integrity, by no worldly conformity, yes, by no inconsistency whatever, they bring a slur upon the holy doctrines they avowedly maintain and love; but let them show that, with the truth in their judgments, they possess grace in the heart, and unspotted holiness in the life. THE Lord’s vineyard is a large one, and the departments of labor are many and varied. And if, in this world of activity—where so many agencies, evil and good, are at work, where so many influences, for weal and for woe, are in constant and untiring operation—there is one class which demands our warmest interest, our most fervent prayers, and our most affectionate sympathy and support, it is those who are actively and devotedly employed in the kingdom and service of Jesus. It is needless to enumerate or specify them: those who are preaching Christ’s gospel; those who are teaching the little ones; those who are instructing and training the young about to enter upon life; those who disseminate God’s holy word, and promote religious literature; those who visit the sick and the dying, the stranger, and the prisoner, and especial and strong claims upon our Christian sympathy. A little expression of kind interest in their self-denying labors, oh, how often has it inspirited, cheered, and encouraged them! What a privilege to repair to the scene of their toil, anxiety, and discouragement, and by a visit, a word, a donation, “strengthen their hand in God”—that hand often so feeble, tremulous, and ready to fall. And is there not a lamentable lack of sympathy for the Christian missionary? Who so much demands, and who so worthy of the support, the prayers, the sympathy of the Christian Church, as those who are her messengers and almoners to the far distant heathen? How much do they need that by our petitions, our zealous cooperation, and our consecrated substance, we strengthen their hand in God! Let us, then, cheer all Christ’s true laborers, remembering that thus, indirectly, we are urging forward His truth and kingdom in the world. Nor let us withhold our sympathy from any case of sorrow, Christian effort, or individual labor, on the plea that its expression and its source are feeble, uncostly, and obscure. Ah! from many a darkened chamber, from many a sleepless pillow, from many a couch of languor, there has gone up the secret, silent, but fervent and believing wrestle with the Angel of the covenant in behalf of some Christian laborer, or some Christian enterprise, that has brought down from heaven the grace and might, and smile of Omnipotence, to support, strengthen, and bless. Thus sympathy has its home in every holy heart and in every lowly dwelling; and there is no individual, however straitened by poverty, or veiled by obscurity, oppressed by trial, or enfeebled by sickness, form the altar of whose heart there my not ascent the sweetest, holiest, most precious and powerful of all human offerings—the offering and the incense of a true and prayerful sympathy. What the Church of God needs as a Church we equally need as individual Christians—the deeper baptism of the Holy Spirit. Reader, why is it that you are not more settled in the truth—your feet more firm upon the Rock? Why are you not more rejoicing in Christ Jesus, the pardoning blood more sensibly applied to the conscience, the seal of adoption more deeply impressed upon your heart, “Abba, Father” more frequently, and with stronger, sweeter accent, on your lips? Why are you, perhaps, so yielding in temptation, so irresolute in purpose, so feeble in action, so vacillating in pursuit, so faint in the day of adversity? Why is the glory of Jesus so dimly seen, His preciousness so little felt, His love so imperfectly experienced? Why is there so little close, secret transaction between God and your soul?—so little searching of heart, confession of sin, dealing with the atoning blood? Why does the conscience so much lack tenderness, and the heart brokenness, and the spirit contrition? And why is the throne of grace so seldom resorted to, and prayer itself felt to be so much a duty, and so little a privilege, and, when engaged in, so faintly characterized with the humble brokenness of a penitent sinner, the filial boldness of an adopted child, the rich anointing of a royal priest? Ah! let the small measure in which you have received the Holy Spirit’s influence supply the answer. “Have you received the Holy Spirit since you believed?”—have you received Him as a Witness, as a Sealer, as a Teacher, as an Indweller, as a Comforter, as the Spirit of adoption? But, rather, have you not forgotten that your Lord was alive, and upon the throne exalted, to give you the Holy Spirit, and that more readily than a father is to give good gifts to his child? That He is prepared now to throw back the windows of heaven, and pour down upon you such a blessing as shall confirm your faith, resolve your doubts, annihilate your fears, arm you for the fight, strengthen you for the trial, give you an unclouded view of your acceptance in the Beloved, and assure you that your “name is written among the living in Jerusalem”?